LEAF Spirit, by Simon Gudgeon, one of Britain’s leading contemporary sculptors, and owner of the sculpture park Sculpture by the Lakes near Dorchester, has been permanently installed at Kew Gardens. Leaf Spirit, a figurative sculpture which evokes a sense of calm, is made from imprints of leaves found in Sculpture by the Lakes. 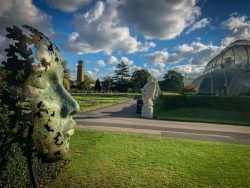 Simon created Leaf Spirit for his sculpture garden at RHS Chelsea Flower Show last year, and it was part of Sculpt at Kew, an autumn 2017 sculpture display at Kew Gardens. This year it was part of the award winning garden, The Spirit of the Woods. at RHS Malvern Spring Show. Simon sculpts mainly in bronze with subjects hat range from wildlife to abstract. He has achieved worldwide recognition with exhibitions in London, New York and Paris and has work in important private collections including the Duke of Edinburgh and the Duke and Duchess of Cambridge. He also has sculptures permanently situated in other public spaces including Hyde Park and the National Museum of Wildlife Art in the USA. Posted in Private View on 1 November, 2018 .